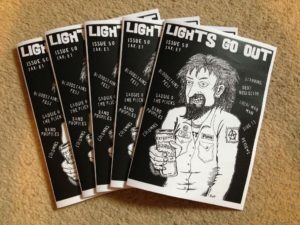 We’re pleased to announce issue 50 of Lights Go Out is out now! Featuring Debt Neglector, Local Mad Man, Slug13, Gadgie Fanzine @ The Flicks (Alien 3), music reviews, zine reviews, columns and a few band profiles (from MUX, The Garage Flowers and Rivita). You can order the new issue over on our page now and we’ll ship them out as soon as we can… thanks again for supporting the zine. We also have more releases in from Back From The Dead Records – so why not pick those up too!